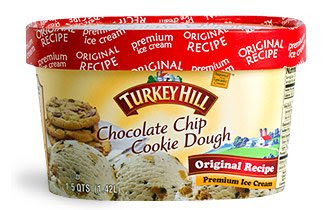 For the longest time, I just assumed it was the cookie dough that gave Turkey Hill that unique flavor. But, like so many other great flavors, I took it for granted without stopping ...to read the label: "Brown sugar and molasses flavored ice cream swirled with chewy cookie dough and dark chocolate chips." Wow, I've just assumed that everyone mixes cookie dough with vanilla and that's that. Instead, they try and take it up a notch. Now, if you eat just the ice cream without a cookie dough chunk in it, the flavor is VERY mild, almost none existent, but throw in a CD chunk, and all of a sudden you are in a whole new place. I'm sorry to say I can't describe it exactly, but if you love cookie dough, you need to give Turkey Hill's a try. I have your review to thank for introducing me to this! I've never tried Turkey Hill ice cream before, and have always been a Ben and Jerry's fanatic, but THIS TH cookie dough ice cream, is the single best cookie dough ice cream on the market! Even though I would've liked more molasses in the base, once you let the ice cream temper a bit, it tastes EXACTLY like milk that had a chocolate chip cookie soaked in it, or leftover Cookie Crisp cereal milk! And the chocolate flakes melt in your mouth, not stab you in the teeth like all the competitors including Ben and Jerry's with their huge obnoxious chunks. The cookie dough itself is plentiful and super gritty, and it's all so perfect! Other "cookie dough flavored" bases taste like toffee, not cookies. This one actually tastes like cookies. It is my new favorite ice cream.